Significantly reduce drying time with the hand held WaterBlade. 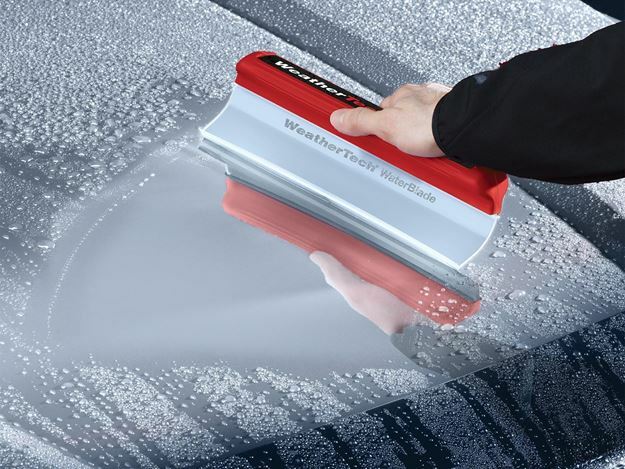 Its effective design easily removes water from almost any surface and features a non-scratch silicone blade that is safe for virtually all paint finishes, surfaces and more. Made in the USA. The WaterBlade features a soft, 12" non-scratch silicone blade that is designed to safely remove water from almost any surface. The hand held WaterBlade conforms to surface contours, which significantly helps reduce the time and effort it takes to remove liquids from surfaces. Its ergonomic design makes it easy to hold and operate. It also features tapered sides and a gentle silicone blade that won't scratch surfaces making it safe for all paint finishes, fiberglass, windows and more. The WaterBlade is great for cars, trucks, vans, RV's, boats, house windows, shower doors and other surfaces around the home. Thoroughly wash and rinse your vehicle before using this product, including any recessed areas, grooves and openings to wash away any foreign materials. Make sure that any dirt or abrasive material has been removed; these materials can cause damage to the vehicle while using the WaterBlade. The handle of the WaterBlade should never come in contact with the vehicle, it can potentially cause damage. Only the blade should come in contact with the surface. Begin drying with the WaterBlade before water has dried to prevent spotting. The WaterBlade should not be used on a dry surface. When using the WaterBlade, only moderate pressure is required to remove the water; the soft, silicone blade will mold to the shape of the car. A small amount of additional pressure may be required for ridges, peaks or extreme contours. Begin drying from the top down to minimize dripping water. Finish drying process with a micro-fiber towel in grills, creases, etc. Wash and rinse your WaterBlade before each use. Silicone blade of the WaterBlade should be protected when not in use. Be careful of sharp objects and edges so that surface of blade is not damaged.